As a loving pet owner, you do everything possible to keep your dog in the best shape, from feeding them the best food to making sure they get daily exercise and regular him vet checks. But are you paying enough attention to the health of your dog's teeth? If not, it's time to change your ways. After all an adult dog has 42 tooth in comparison to an adult humans measly 32. So it is even more important to take good care your dog’s teeth to help reduce bad breath, improve overall health and increase your pet’s lifespan. But good news there is some simple things that can be done to improve your dog’s dental health! Dental health has a lot to do with what you are feeding your pet. If you are looking to improve your dog’s dental health there are specific dry foods and treats that help to keep your dog’s mouth in good form by scrubbing the teeth as your pet chews. Meanwhile there is another range of foods that include additives that help to keep plaque soft so it doesn’t form tartar. If you are worried about your dog’s dental health it is good to check with your vet to see if a dental diet would be beneficial for your pet. It is important to feed your dog a varied diet, as dogs that are only fed on wet or soft food more more likely to experience dental problems. It is important that dogs are also fed dry biscuits or kibble as this can help scrape dirt off the surface of teeth while they eat. In general, dry food can leave the mouth cleaner than wet food, as wet food is stickier and more easily trapped in between teeth. Even if your dog prefers wet or needs to eat wet due to medical issues it is important to include some dry kibble in their daily diet. The best way to protect your dog’s teeth is with regular brushing. Although this can take a bit of getting used to for you and your dog. All you need to do is get a toothbrush made especially for your dog, and a specially formulated dog toothpaste that is designed to be palatable and gentle on your dog's digestion. There is a lot of dental care kits on the market that make it easy to clean your dog's teeth like the Tropiclean Oral Care Kit that includes both toothpaste and 2 types of toothbrushes. Although no matter what you do please do not use human toothpaste, as this can irritate a dog’s stomach. When brushing your dog’s teeth just like your own, there is actually a technique! Place the brush at a 45-degree angle to the teeth and clean in small, circular motions. Work on one area of your dog’s mouth at a time, lifting their lip as necessary. The part of the tooth that usually requires the most attention is at the top near the gum line. If your dog resists having the inner surfaces of her teeth cleaned, don’t fight it, as only a small amount of tartar accumulates there. Once you get the technique down, it is good practice to start brushing their teeth two to three times a week. An easy and rewarding way to prevent dental issues for your dog is to provide them with dental treats or chews. As when a dog chews for a period of time, the salivary glands are stimulated and more saliva is produced and released into the mouth. What you may not know is that saliva has amazing antibacterial properties, which in combination with the scrubbing effect from the chew treat, can help control the buildup of plaque on your pet's teeth. There is a range of specifically designed dental treats on the market or a range of natural chews such as bully sticks that help to promote healthy teeth and gums by removing built up plaque and tartar. Take care when selecting toys for your dog as some common toys such as tennis balls can cause a lot of damage to your dog’s teeth. For example when your dog chomps down on a tennis ball the fuzz on the tennis ball acts like a sandpaper, gradually wearing down their teeth. You can avoid this unnecessary damage to your dog’s teeth by providing them with balls or fetch toys specifically designed for dog. A simple and enjoyable way to maintain your dog’s dental health is to provide them with a bone to chew on. A nice long gnaw on a raw, natural bone can remove surface dirt and bacteria on exposed teeth. Although care needs to be taken when selecting a bone that is safe for your dog. Some good options are veal necks or lamb brisket bones because they are softer and gentler on the teeth. It is important to avoid excessively hard items — such as hooves — as well as cooked bones, which can easily splinter. Also when picking a bone do not give your pet weight bearing bones like leg bones as they are too hard and could damage your dog’s teeth. It is also vital that you select a bone that is appropriately sized for your dog so they cannot choke on it or swallow it whole. When you do give your dog a bone you need to be sure to monitor your dog as he chews, and remove the product when it become small enough to pose a choking hazard. Good quality chew toys can be helpful in slowing dental disease because of their abrasive action when chewed. When looking for a chew toy for dental health look for a toy that is bendable, softer than teeth, and a suitable size for your dog so it can’t be swallowed. Look for rubbery Kongs and balls, bendable bones, and chew toys you can hide treats inside. Look for items that are somewhat flexible, never rock hard, and have a rough or bumpy surface. Try a variety of styles to see what your dog prefers. There are also specific dental toys on the market like the Yours Droolly Rotating Dental Bone that acts as a rubbery chewable toothbrush toy that freshens your pets breath and cleans teeth while they chew. Chew toys are a good option for dogs who on a diet or have food allergies. As they can provide dental benefits without the extra calories. They can also satisfy your dog’s natural desire to chomp, while making his teeth strong. Gnawing on a chew toy can also help massage his gums and help keep his teeth clean by scraping away soft tartar. Chewing is also good for your dog’s overall mental health reducing their overall stress level, preventing boredom and giving them an appropriate outlet for their natural need to chew. Routine dental exams from your vet can be beneficial, especially if your dog’s teeth are very crowded or difficult to brush. Brachycephalic or short-nosed breeds like pugs and toy breeds like chihuahuas and poodles are often predisposed to dental problems because their teeth often don’t have normal alignment. And toy breeds often have a crowding problem, so no matter how vigorously these dogs chew, it doesn’t remove all the plaque and tartar from their teeth. Over time, bacteria can build up in your dog's water bowl and on his or her teeth and gums. When bacteria is ingested it can cause a range of problems for your dog. A water additive is safe to use and can eliminate bacteria in the water and in your dog's mouth. They are easy to use and a great option for dog’s that may not tolerate tooth brushing. By adding the product to the dog’s water bowl it reduces the pH of your dog’s mouth and help to prevent the buildup of tartar before it binds to the enamel on your dog’s teeth. 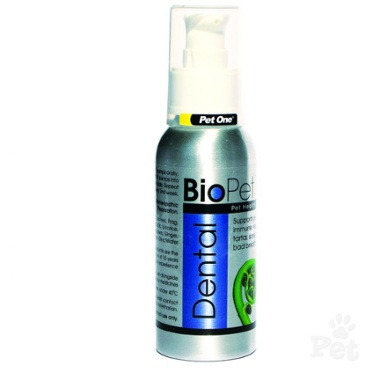 There are also multi use products like BioPet Dental Drops that can be added to your pets water bowl or used orally to support oral health and freshen breath. With regular effective home dental care, and provided your pet isn’t genetically predisposed to heavy plaque and tartar build-up. It is possible that your pet may never need a professional teeth cleaning performed by a vet. However, every pet should still receive routine dental check up in their annual vet visit to ensure that there dental health is on track and to identify any potential issues before they get worse.